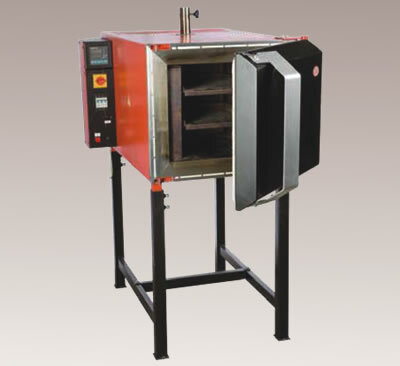 Tempering Furnaces with Atmosphere Circulation PP - LAC Asia Ltd. The LAC line of PP tempering furnaces with forced circulation of the inner atmosphere are used for special applications like preheating and annealing in industry, or the preheating of molds. The standard PP design includes a durable stainless steel muffle with high mechanical and corrosion resistance, shelves and a manually controlled ventilation flap. The PP's horizontal air circulation ensures even air flow around the furnace interior and precise temperature distribution according to DIN 17052-1. The PP's design and top-quality insulation also provide for very low power consumption and operational expenses. The PP comes in 450?, 650? and 850? versions. PP furnaces are used for steel tempering and other heat treatment of materials up to a maximum temperature of 450°C, 650°C or 850°C. Stainless circulation insert with long lifetime and high mechanical and corrosion resistance. Horizontal circulation of the inner atmosphere ensures equal temperature distribution inside the inner furnace chamber. High-quality insulating materials secure low furnace operating costs.